There are many reasons why trains are cancelled. Sometimes they are completely outwith the rail system. On Tuesday 9th October a notice appeared: "Due to failure of the electricity supply at Georgemas Junction the line is closed." 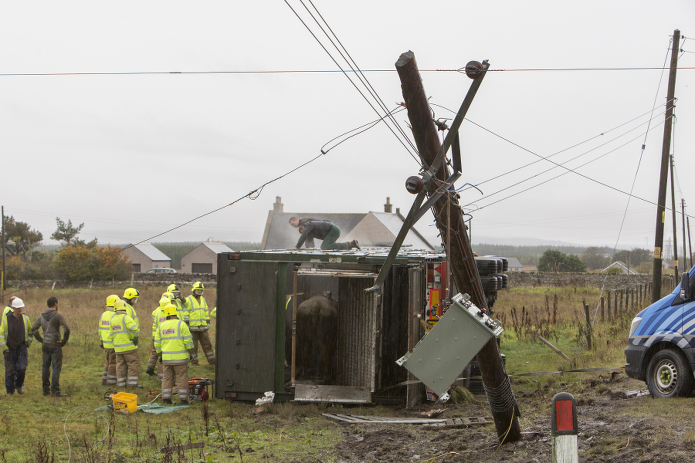 A bit vague and mysterious; the truth however was that the outage was caused by a cattle transporter leaving the A9 at Spittal, a few miles south of Georgemas Junction, the rear section overturning and badly damaging a Scottish Hydro power line in the process. Work underway to rescue cattle from the transporter trailer that left the A9 and ended up on its side in a field at Spittal. The trailer also brought down an electric pole and transformer, which can be seen hanging in the foreground. Photo: Robert MacDonald/Northern Studios. Passengers had to complete their journeys by bus - and the cattle weren't too pleased either!